PATRIOTIC Front (PF) Chairperson for Elections, Jean Kapata has called on the ruling party’s members to avoid unnecessary disagreements and squabbling if the party has to win the 2016 tripartite elections. Addressing party officials from different wards in Chadiza in Eastern Province yesterday, Ms Kapata said President Lungu only marginally won the January 2015 elections because there was too much disunity among party members. Ms Kapata said this in a statement issued by PF vice-secretary for mobilisation committee Samuel Kasankha. “So many people from the PF wanted to stand as president and this created many camps. The infighting caused deep divisions which enemies of the party from within and outside took advantage of. The result was that we almost lost the elections,” she said. She warned that this could repeat itself in 2016 unless members guarded against unnecessary divisions and disunity. Ms Kapata urged the party to rally behind the leadership and candidacy of President Lungu, including those who would be adopted as candidates for parliamentary and local government seats for the 2016 election. And most party officials in the province have cited long distances between wards and branches as being a major impediment to effective party mobilization. PF mobilisation chairman Charles Banda has assured that everything possible will be done to ensure that such impediments are addressed. Speaking in Chipata, Mr Banda urged the members to continue working and growing the party in Eastern Province. And speaking earlier at the same event, Women chairperson Esther Banda urged the members to tailor their campaign messages on the developmental projects the party had embarked upon in the last four years. Mrs Banda said the projects were good enough testimony that the PF is a working government, so there is no need to struggle in convincing voters to vote for continuity and progress. 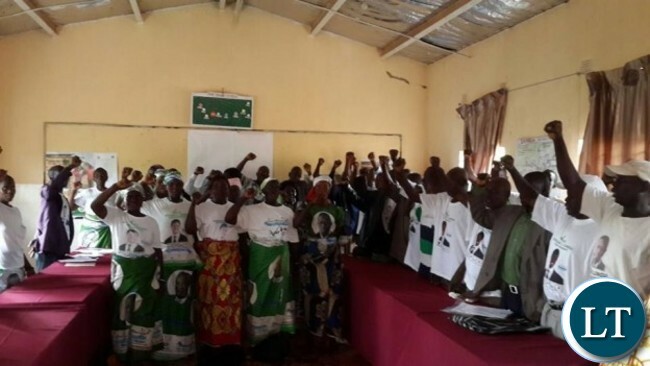 The three PF members of the Central Committee are in the province to strengthen the party structures at the grassroots and prepare them for the 2016 tripartite election. Messages of Winning 2016 elections is all I hear from most pf leaders. How come there is no gas canisters? Whats wrong with this party to be treated differently than the rest? Police to terrorize the opposition. remember you live by the sword you die by the sword. your end will come.Looks like Lungu will go down as the worst President of Zambia.